PEBBLE BEACH, Calif. (August 26, 2018) — After an intense competition that drew diverse cars from around the globe, the coveted gold Best of Show ribbon was placed on the deep blue bodywork of a 1937 Alfa Romeo 8C 2900B Touring Berlinetta at the 2018 Pebble Beach Concours d’Elegance. It was a match meant to be. His Alfa Romeo won its class before competing for Best of Show, and took home two other awards: it received the Charles A. Chayne Trophy and was named the J. B. & Dorothy Nethercutt Most Elegant Closed Car. The Pebble Beach Concours gathered 209 cars from 17 countries and 31 states on the 18th fairway of Pebble Beach Golf Links. This year, the Concours also raised an incredible $1.8 million for charity. Through the Pebble Beach Company Foundation, the primary charitable partner of the Concours, these funds will benefit over 80 local charities, impacting the lives of more than 10,000 children annually in Monterey County. 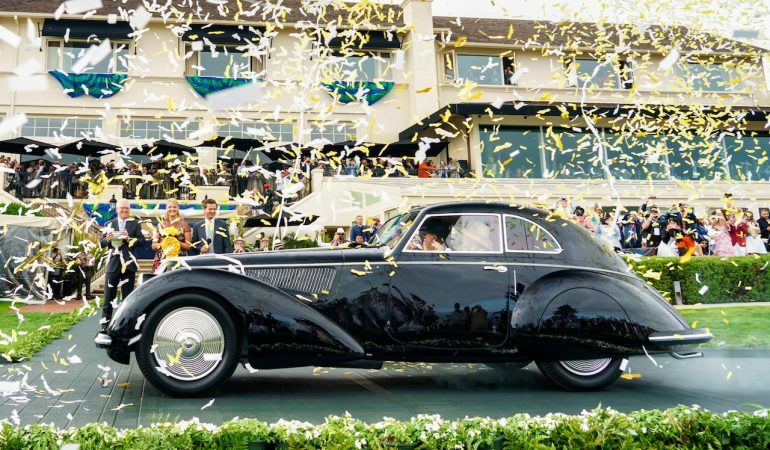 The 69th Pebble Beach Concours d’Elegance returns to its usual third Sunday of August next year; it takes place on Sunday, August 18, 2019, and will celebrate the centennials of Bentley and Zagato.